Chicco's tableware range is designed to help mothers in teaching their kids how to eat at an early age. Thanks to its ergonomic handle and the special curvature, the Soft Silicone Spoon is ideal for spoon-feeding in the most efficient and easy way. The specific shape of the tip allows to introduce into the baby's mouth the right quantity of meal and to respect the baby's growth. 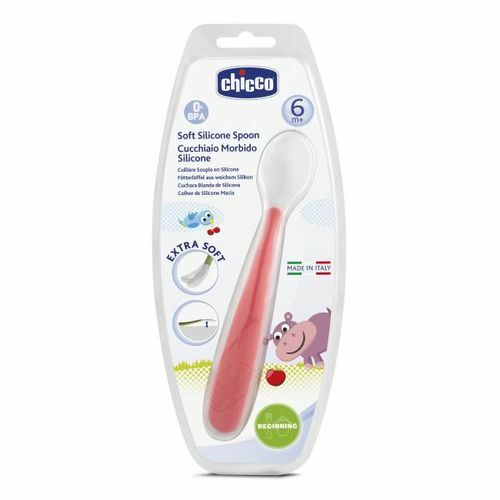 Additional Information: The largest baby care brand in all of Europe, Chicco is committed to bringing happiness to families all over the world with over 50 years of expertise in everything for baby. By understanding babies and what makes them happy when they sleep, eat, and play, Chicco creates a variety of baby care products that feed their needs and desires and is developed in accordance with the latest and best research. Explore the entire range of Feeding and Nursing available on Nykaa. Shop more Chicco products here.You can browse through the complete world of Chicco Feeding and Nursing .